In this post, I explain how to use an online file storing and sharing service like AARNet’s CloudStor (but any WebDAV service will do) to access and update your Zotero library from different computers. In this post I show how to enrich a ggplot map with data obtained from the Open Street Map (OSM) API. 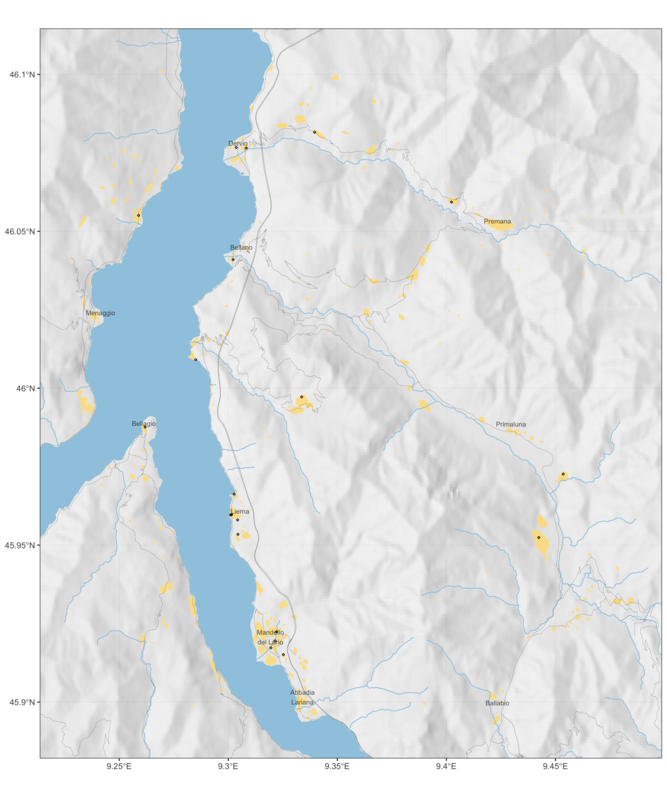 After adding elevation details to the map, I add water bodies and elements identifying human activity. To highlight the areas more densely inhabitated, I propose to use a density-based clustering algorithm of OSM features. Saint Michael’s Abbey, in the Susa Valley, Piedmont. Source: Wikipedia. In Medieval Europe, information was physically concentrated in very few secluded libraries and archives. Powerful institutions managed them and regulated who could access what. The library of the fictional abbey that is described in Umberto Eco’s The Name of the Rose is located in a fortified tower and only the librarian knows how to navigate its mysteries. Monasteries played an essential role in preserving written information and creating new intelligence from that knowledge. But being written information a scarce resource, with the keys to libraries came also authority and power. Similarly, Internet companies are amassing information within their fortified walls. In so doing, they provide services that we now see as essential but they also contravene the two core principles of the Internet: openness and decentralisation. The abundance of economic data and the scarcity of social data with a comparable level of granularity is a problem for the quantitative analysis of social phenomena. I argue that this fundamental problem has misguided the analysis of the electoral results of the Five Star Movement (M5S) and its interpretation. In this article, I provide statistical evidence suggesting that — in the South — unemployment is not associated with the exceptional increase in the M5S support and that local participation is a stronger predictor of support than most of the demographics. an increase in the importance geography as an explanatory dimension for the distribution of votes. 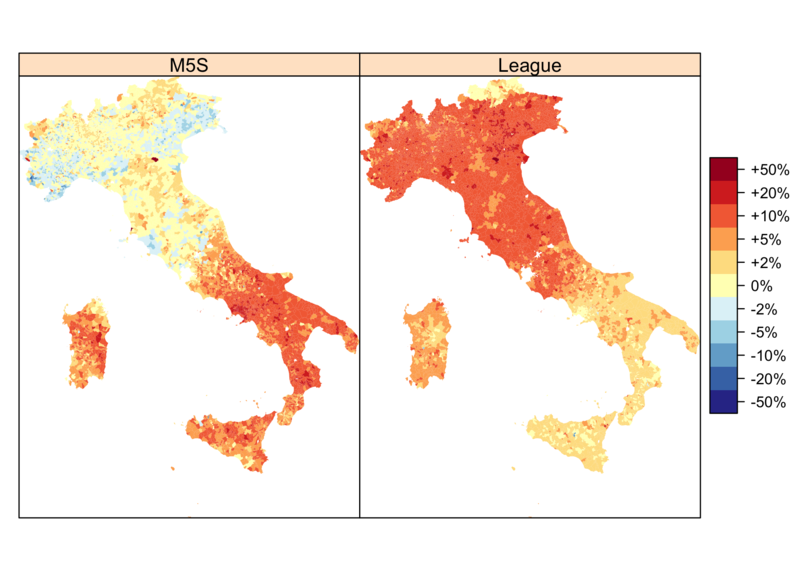 The following two maps show where the M5S and the League have increased electoral support from 2013 to 2018. (Electoral data are always data for the election of the Chamber of Deputies). The geographic pattern is quite simple. The M5S has increased its support in the South and maintained its votes in the North, the League has significantly strengthened its support in the North but has also collected votes in the South, where it had virtually no support. The third and the fourth most voted parties, the Democratic Party (PD) and Berlusconi’s Forza Italia (FI), have lost votes almost everywhere. 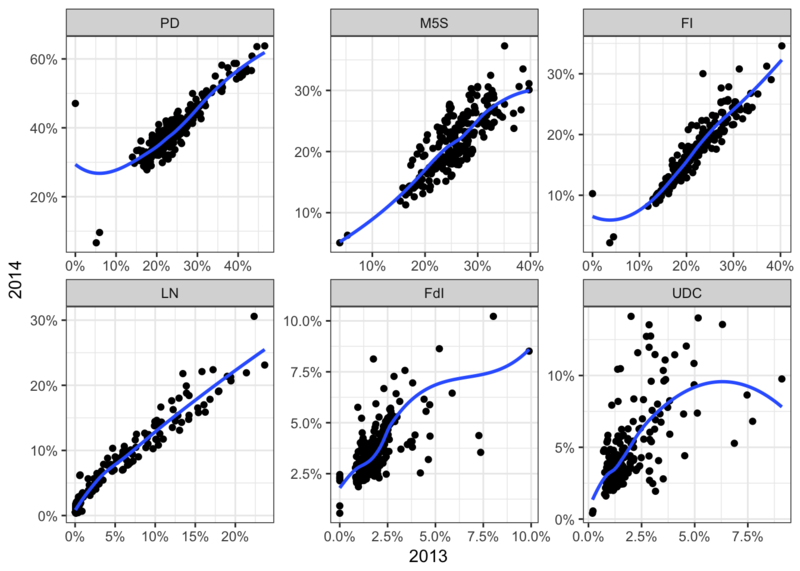 If we map the results of the four parties side-by-side with the same scale, the PD and FI almost faded into the background. Yet, major metropolitan areas do not always follow the national trend. If Naples unambiguously voted M5S, Turin, Milan and Rome did saw the Democratic Party as the most voted party in the wealthiest districts. 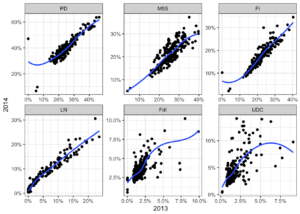 The density of the distribution of results at the commune and sub-commune level in the macro regions indicates that if the M5S electorally dominates in the South and in the two major islands, the League is the most popular party in the North. The territoriality of the results, especially along the North-South dimension, makes the analysis especially complicated. 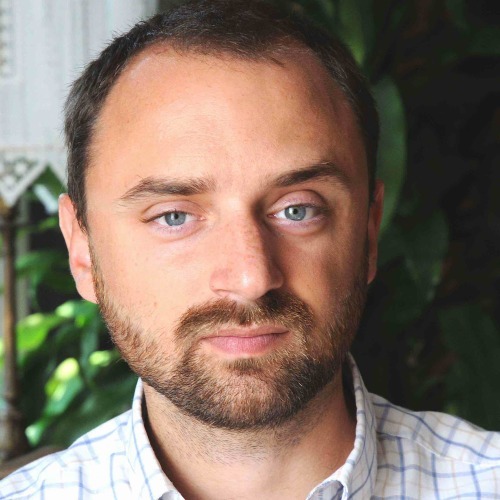 This because the strong result of the League in the North and of the M5S in the South might simplistically suggest that immigration (which is much stronger in the North) explains the League’s result in the North and unemployment and poverty (stronger in the South) explain the M5S’s result in the South. This reading is especially attractive since immigration and the M5S proposal to introduce a guaranteed minim income have dominated the campaign. This simulation of the results for the 2018 general election is based on the results from the last two national elections (the Italian parliament election in 2013 and the European Parliament election 2014) and national polls conducted until 16 February 2018. The simulation is based on one assumption, which is reasonable but not necessarily realistic: the relative territorial strength of parties is stable. 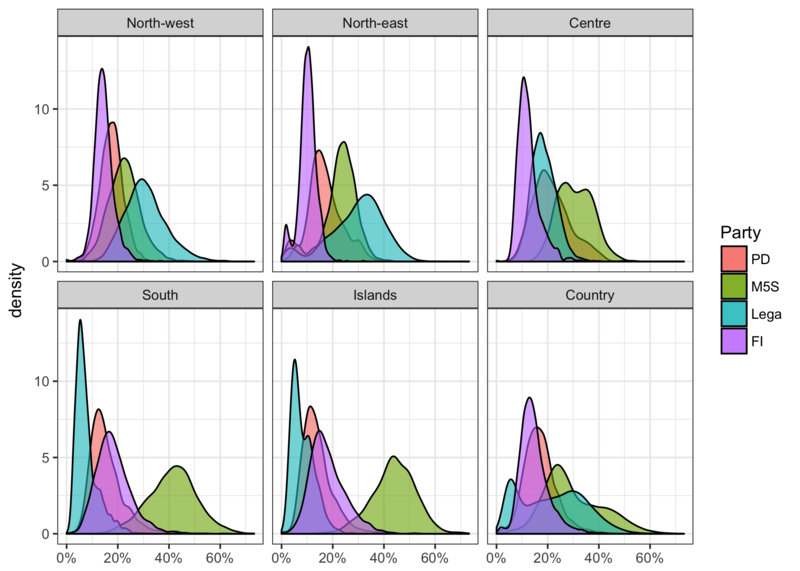 From this assumption derives that if the national support for a party (as measured by national voting intention polls) varies, it varies consistently and proportionally everywhere. A rising tide lifts all boats and vice versa. The assumption has some empirical justification. If we compare the difference from the national support (in percentage) for each district in 2013 and 2014 we see a significant correlation, especially in the major parties. The 2016 Italian referendum torpedoed the constitutional reform presented by the government presided by Matteo Renzi (41). According to the final count, which includes 1.2 million votes cast overseas, the reform was rejected by almost 60% of the voters. Three parties played a predominant role during the electoral campaign: the ruling Democraric Party (PD), leaded by the chief of government Renzi, the Five Star Movement (M5S), founded and leaded by Beppe Grillo (68), and the Lega Nord (LN), leaded by Matteo Salvini (43). The fourth Italian party, Forza Italia, for different reasons – including the health of Silvio Berlusconi (80) – played a minor role. Leggo e rispondo al post di Massimo Mantellini (Il M5S, il wifi e il principio di precauzione) in cui si evidenzia con preoccupazione come il Movimento abbia portato in Parlamento, dunque in qualche modo legittimandole, posizioni anti-scientifiche; un “pensiero tossico, banale e a suo modo inattaccabile, che nuoce al Paese intero”. Il Movimento Cinque Stelle con un bacino elettorale che si aggira tra il 25 e il 30% (8.5-10 milioni di persone) è necessariamente complesso in termini di rappresentanza demografica e di diversità di opinione. Considerando un astensionismo del 25%, se vi trovate in fila al supermercato delle 10 persone che vi precedono circa due votano M5S. Purtroppo questa complessità raramente traspare nelle narrazioni giornalistiche, e chi fa informazione tende (troppo) spesso a preferire i tratti caricaturali (da cappello di carta stagnola o da gita in Corea del Nord, per intenderci). Ma questo tipo di informazione è sbagliata: primo perché distorce nella semplificazione, secondo perché incoraggia comportamenti macchiettistici, grotteschi e sbracati da parte di chi sedendo in istituzioni affollate cerca visibilità.